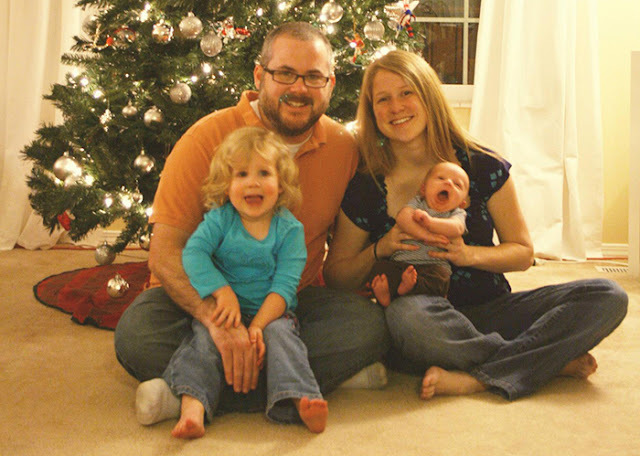 This is the second post in a series of posts I am writing in a partnership with Campbell’s Soup and their #RealRealLife campaign. You can watch all their adorable videos here. I've been compensated by Campbell's both in money and in delicious soup that I would have eaten anyway because I love soup. A lot. By the way, did you know that in the U.S. Campbell sells nearly 2 billion cans of soup every year? The Kinnear house probably accounts for about half of those sales. Stevie and I’s first fight was on Thanksgiving 2009. We had just left her dad’s house after having just left her mom’s house after previously having left her aunt’s house which we stopped by after dropping in on her Grandma to say hello. 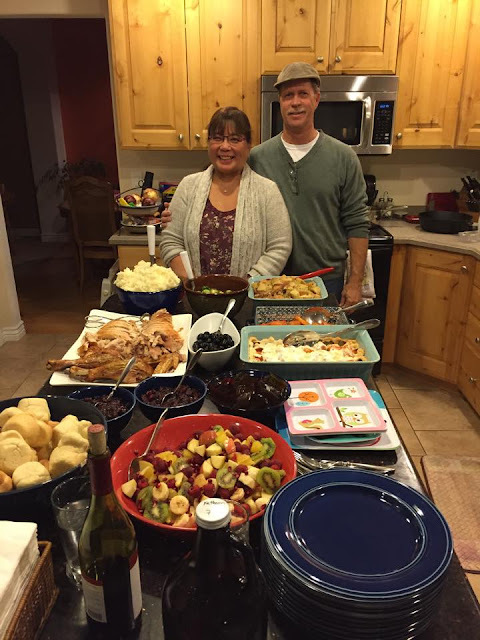 Being a transplant to Salt Lake when I was five, I was not accustomed to Thanksgiving being comparable to a multi-city rock and roll tour, and by the time we had left our final stop at her dad’s I was just about spent. It was a very fun day, but it was also an exhausting day. So… in the midst of a fatigued and food coma ridden ride home, I “suggested” that the Tour de Utah that was Stevie’s typical Thanksgiving (and Christmas) was unsustainable. She did not react well. To be fair, there is a reason I put ironic quotation marks around “suggest” in the previous paragraph. I didn’t suggest anything. I stated what I perceived to be a fact. I think I said “That was a great day, but when we have kids this 10 stops in a day thing is done.” I didn’t really intend to put my foot down. I thought I was just stating a pretty obvious and eventual reality. It didn’t come across like that. Stevie didn’t yell. Stevie rarely yells. Stevie gets quiet. I felt horrible. It was the triple-lindy of screw ups. I had insulted her holiday tradition and offended her, while simultaneously bringing up having kids and getting married for the first time in our relationship. I am not a smart man. Luckily, she is a very forgiving woman. Instead of the fight I started over Thanksgiving leading to the end of our relationship, it eventually transitioned into this: “OK. If we’re going to be together, what do we want our holidays together to look like.” And with that one question from Stevie, my holidays and her holidays became our holidays. Instead of putting our foot down about what we do, we decided to create our own traditions together. Here are a few of them! It’s not as hectic as it once was. 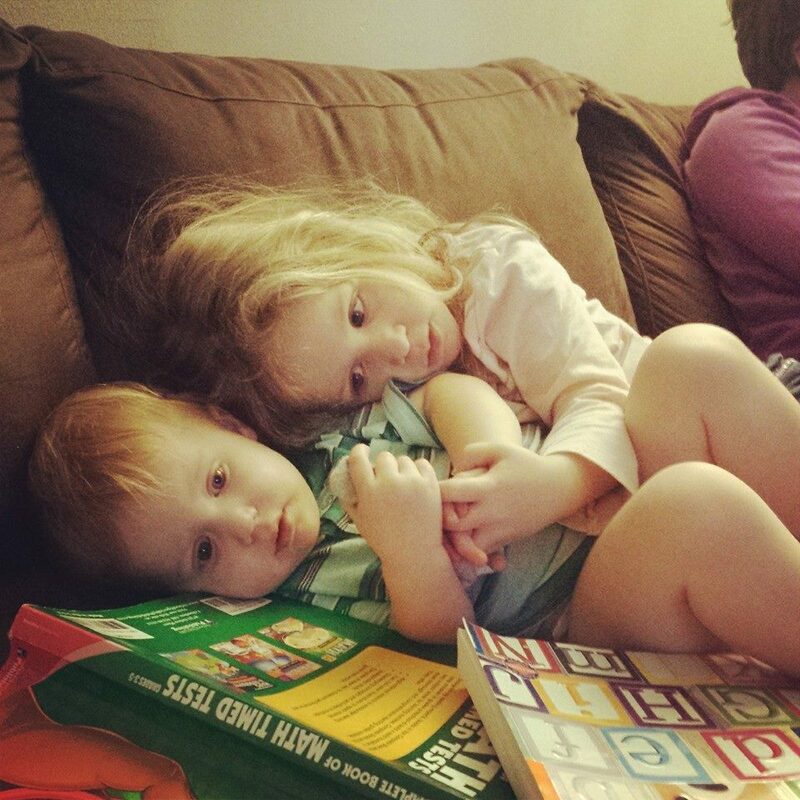 Like I had originally thought, having kids necessitated some toning down of the schedule. But, we still make multiple stops and we still see as much of Stevie’s side of the family as we can. My side of the family lives all over the country now, so we leave nice messages on Facebook. Sure, it is a little stressful at times, but I get have Green Bean Casserole made with Campbell’s Condensed Cream of Mushroom at three different houses, and that makes it worth it. I know that a lot of families do this, but this is one of my favorites and it feels very much like it belongs just to us. The day after Thanksgiving I wake up and trudge into the totally not messy, and very well organized area that is our garage. Then I spend the next 45 minutes playing Indiana Jones and the Lost Christmas Decorations. After that we spend the day together not shopping. In the evening everyone in our immediate family knows they are welcome to stop by, grab a bite to eat, and help us decorate the tree. Since we rarely know how many people are coming, I usually will make something that is easily prepared and can serve a bunch of people on the fly with minimal attention from me. This year I made my famous (in my family at least) sloppy-joes. They are super simple and super delicious. The secret ingredient? Campbell's® Condensed Chicken Gumbo soup. They're not your standard BBQ, overly sweet sloppy joes. I’ll include the recipe at the end of this post. The first year we had our daughter, her grandma made us an advent calendar as big as a medium sized human. Each day has enough space for us to wrap and put a tiny present. 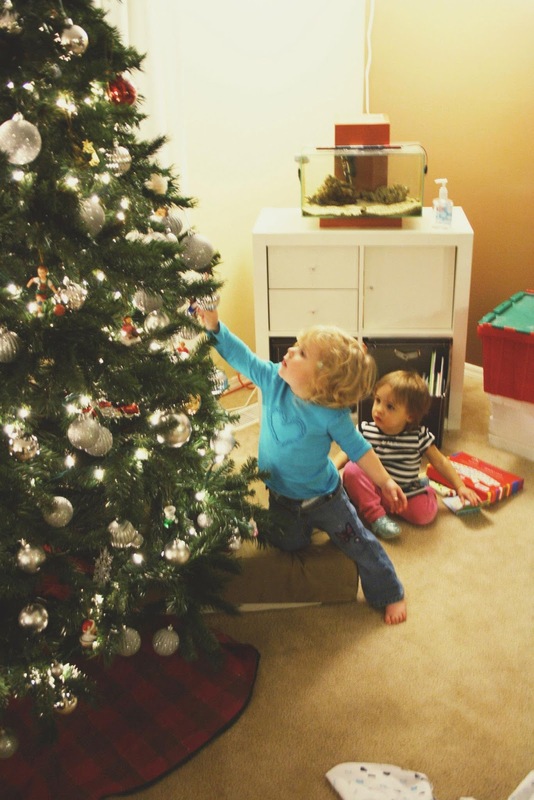 They’re usually silly presents, like a snack size box of raisins, or a toy from the 99 cent bin, but just being able to unwrap something every day has both our kids sprinting in the door when we get home in the evening. Yes, wrapping all the tiny presents is kind of a pain, but that’s OK because Stevie does it. This is pretty much every night from Thanksgiving until Christmas. We really shouldn’t have bought them on DVD. Have I mentioned how much I love Green Bean Casserole? I think I might have. Honestly, it's worth mentioning again. It isn't just a side dish with our family - it is a tradition. Apparently I'm not alone in my love. On Thanksgiving 2014 the recipe had 722,052 page views and accounted for a whopping 70% of the traffic to the Campbell's Kitchen website that day. 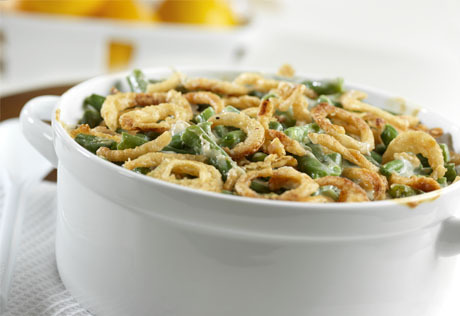 In fact, over 30 Million households make green bean casserole each year... because they are smart and they love delicious things. It's been my favorite since I was my daughter's age. If for some reason the dog jumped up on the table and ate every other Thanksgiving dish, but somehow left the Green Bean Casserole, I would still be happy. Stevie can have her crescent rolls. The kids can have their jello, and their crescent rolls, and then more jello. The GBC is mine!! On Christmas Eve we don't do a big dinner, mainly because of another tradition I'll talk about in a moment. So in place of a big dinner, we usually have something that isn't super involved but is also comforting. Some years it is as simple as a grilled cheese and Campbell's Condensed Tomato Soup. This year I think we're going to give these Campbell’s Fresh Brewed Soups a try. They go in your Keurig! I made one for myself the other day, and just loved it. I think what the kids will like about them is that they will be able to pour the noodles in the cup and press the button. They love to participate in things like that. And sure, it's not a giant ham dinner, but we have a lot of those this time of year. Noodle soup is a favorite around our house, and Christmas Eve can be a time for favorites. Check it out! I even made an Instagram of it, complete with sound effects! I’ve written about this before, but Christmas Eve at Denny’s is one of my longest running traditions. After the family dinner, and after the kids go to bed, I sneak out and meet and meet some friends at Denny’s. I’ve been doing it for almost 20 years now. You can read all about it here, but here's the gist of it. When I was in High School I was working a retail job and had to skip the Family Christmas vacation. I ended up home alone on Christmas. 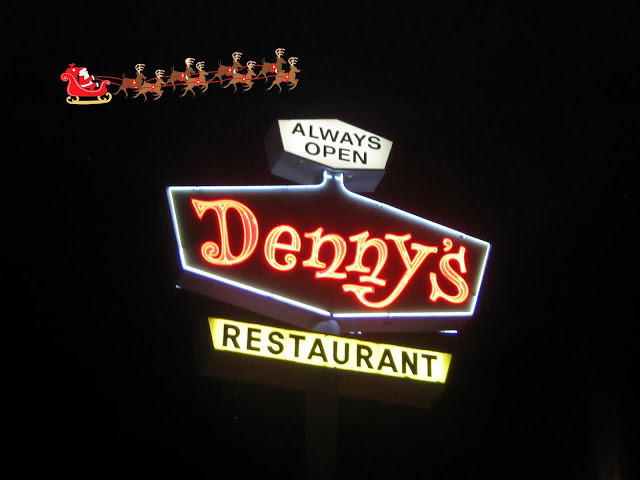 After my buddies were done with their family Christmas Eve dinners, they came and picked me up and took me to Denny's. We've been meeting there ever since. Since I go out after the kids go to bed on Christmas Eve, the Santa Portion of my job tends to take place when I get home. That is OK though. Stevie and I team up. Stevie wraps the presents. I put together the things that need putting together. We stack them in a way we hope will cause gasps of joy in the morning. We eat the cookies as messily as we can so our kids can feel like little CSI Investigators when they determine that Santa has been there. I write a note in my most unrecognizable handwriting possible telling the kids how proud I (Santa) am of them. Then comes my second most favorite part of the entire holiday season. Stevie and I sit down and look at the tree. We are exhausted. She lays her head on my shoulder and I say something like “We did good” and she agrees. Sometimes we talk about that first fight, about how it’s not always easy to take two lives and smoosh them together… about how somehow we’ve made it work so far. I’ll kiss her forehead. She’ll kiss my cheek. And together we’ll peek in on our kids, our smooshed together little lives with their tiny adorable snores, waiting to wake up and see what Santa brought them. They get their gifts in the morning. Ours are right in front of us. This recipe has been in my family for years. That said, it was probably taken from the back of a soup can at some point because, as I have found out many many times, most of our "family" recipes are from the backs of boxes and soup cans. Doesn't matter. Still delicious. 1. Brown ground beef. Salt and Pepper as needed. 3. Mix beef, onion and all other ingredients in deep pan. Let simmer, covered 30 minutes. 4 Get back to doing other more enjoyable things than cooking.